Our team has put in a lot of hard work over the last 12 months to develop VitusVet into a digital pet care platform that disrupts the industry, advances veterinary technology and contributes to making pet wellness more accessible. VitusVet announced today that it has been awarded the Maryland Incubator Company of the Year Award for Best Technology Company. The awards are held annually to recognize achievements from incubator startups around the state of Maryland. "We're beyond excited to accept the Maryland Incubator Company of the Year award for Best Technology company,” said Dr. Mark Olcott, CEO and co-founder of VitusVet. “Our team has put in a lot of hard work over the last 12 months to develop VitusVet into a digital pet care platform that disrupts the industry, advances veterinary technology and contributes to making pet wellness more accessible." VitusVet was one of eight companies awarded the Maryland Incubator Company of the Year out 21 finalists chosen from over 200 nominated companies. The award ceremony was held on Thursday evening, June 15, at the American Visionary Art Museum. The Maryland Incubator Company of the Year awards were founded in 2001 by Maryland Technology Development Corporation (TEDCO), McGladrey and Saul Ewin LLP to honor success stories of local technology companies. The awards are chosen by a selection of committee regional industry leaders and early-stage investors. Past winners of the award include Airphoton LLC and SocialToaster. 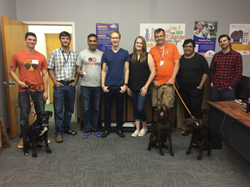 VitusVet was founded by Mark Olcott, DVM, MBA and Kalpesh Raval, MBA, in 2013 as a solution to better share medical information among general practitioners, emergency veterinarians, specialists and pet owners. VitusVet has grown into an all-in-one digital pet care platform for veterinary practices and pet parents. The VitusVet mobile app is free for pet parents and can be found in the Google Play store and the iTunes App store. For more information about VitusVet please visit http://www.vitusvet.com, or contact kchurchill(at)vitusvet(dot)com. To download the free VitusVet app, please visit: http://vitusvet.com/download-the-free-app/.